02:48 — Doctor Who: Matt Smith to kick off with 60 minute episode. 03:49 — Doctor Who: Neil Gaiman set to write for 2011 season. 06:06 — The Black Hole: Hollywood goes back to the remake well. 09:06 — Star Trek: Flash mob to promote Star Trek Online. 10:15 — Star Wars: Flash mob lightsabre fight in Bristol. 11:24 – Doctor Who: Predictions for the 2010 season. 21:24 – 30 Second Recommendation: The Amtrack Wars. 22:44 – The Vampire Diaries. 31:25 – Competition Results: Name a Doctor Who Companion to win a Whooverville 3 Disc DVD set. 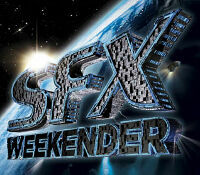 35:07 – The SFX Weekender. 70:20 – Farewell for this podcast! 70:54 — End theme, disclaimer, copyright, etc. 73:32— Max Buffer’s Media Museum podcast promo. Radio Free Skaro: Series Fnarg Details Revealed. The CW: The Vampire Diaries. The Whoovers Doctor Who Group (with their many great DVDs!). YouTube: Bristol Lightsabre Flashmob – The Official Video. Professor How and B-Movie Invasion Podcasts. Max Buffer’s Media Museum podcast. 02:03 — Torchwood USA: Fox TV developing an American Torchwood. 03:48 — Doctor Who: Computer game to be developed? 06:02 — Rex Is Not Your Lawyer: Canned before it got started? 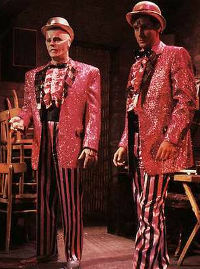 07:20 — Red Dwarf: Chris Barrie suggests a new full season is possible. 09:05 — Doctor Who: Billie Piper talks about Hollywood Doctor Who film. 09:49 — Star Wars: Wizards of the Coast drop pen & paper RPG and miniatures line. 25:11 – Doctor Who: Computer games past and future. 35:32 – 30 Second Recommendation: Iain M Banks’ Culture novels. 56:40 – Farewell for this podcast! 57:05 — End theme, disclaimer, copyright, etc. 64:40 — The TARDIS Tavern promo. 66:08 — The Ood Cast promo. Wikipedia: Rex Is Not Your Lawyer. Wikipedia: Doctor Who Computer Games. YouTube: The Day of the Triffids (1981). Big Finish: Jago and Litefoot Series One.